The Imaginationland episodes of South Park were a trilogy of goodness. And who did I spy in the lineup of evil characters but Mordred, the gold-armoured villain from MY FAVOURITE MOVIE OF ALL TIME ™ – Excalibur. We watched it again last night and it remains number one. The lush images, the epic grandeur, the humour, the acting … stars included Helen Mirren, Liam Neeson, Nicholas Clay (also known for starring in “Lady Chatterley’s Lover” with Sylvia Kristel), Patrick Stewart, Gabriel Byrne and I just noticed the lovely Ciaran Hinds too. And Robert Addie as the older Mordred I remember well from his role of Guy of Gisborne in the Michael Praed “Robin of Sherwood”. Music is used effectively, and the drama of “O Fortuna” by Carl Orff at various set points of the movie is rousing as heck. “Excalibur” is a beautiful rendering of the classic Arthur story, a myth that I love so much it has sunk into my personal mythology. When I got a tattoo, I left the middle of it empty until I thought of an image I wanted there. And after some time, I decided to show the Lady of the Lake brandishing Excalibur. 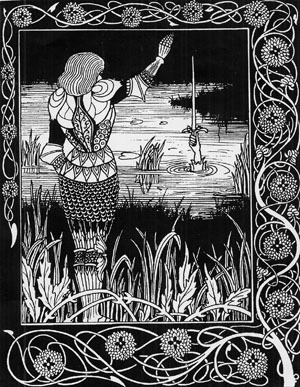 My love of Arthurian legend is very much interwoven with my love of Pre-Raphaelite art, poetry, literature … and here is another view of the legend from Aubrey Beardsley. That’s the line that resonates with me, and in the movie (directed by John Boorman of “Deliverance” fame) the Lady of the Lake’s brandishing of the sword, with her arm swathed in translucent sparkling cloth is just perfection. This is one of my all time favourite movies too. Haven’t seen it for a few years but I’ve just found out it will be on TV2, Sunday 25 May, 1.50am. I’ll be sure to record it for posterity.